Talk about a standout! 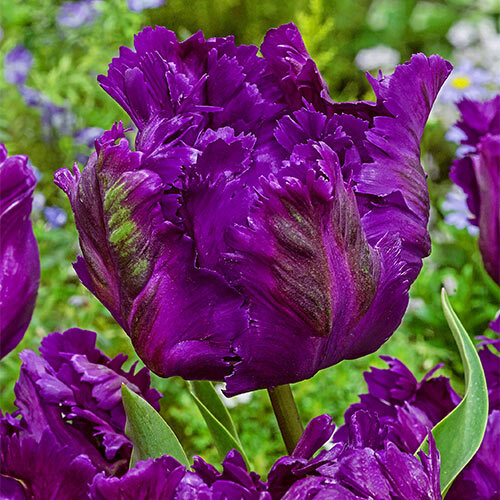 This new Parrot-type tulip is so extraordinary, you'll be tempted to snap up all you can for your customers and clients. Negrita Parrot is a stunner with feathery, beetroot-purple flowers that feature purplish veining and contrasting, deep green markings. Its soft, lush petals curl and flex to create its unique form, and they open earlier than many other Parrot types. So your customers can enjoy plenty of these magnificent tulips in the springtime border before their neighbors' blooms even emerge for the season. Exceptional variety for cut-flower bouquets, too. Easy to grow and tolerant to many soil types, so long as it's well drained. Only dead heading. It is important to let the foliage mature and die down naturally, do not cut back. Next year's bloom is being developed.